In today's fast paced world of website design, new services are breaking on to the scene that provide elegant, all-encompassing solutions for those looking to build up a compelling web presence. Two of the major players in this new arena are Webydo and Squarespace. Both platforms are built to offer professional web designers a complete platform for creating feature rich web designs without the need for a degree in web development. Despite the shared goal of these two services, their respective approach to web design is actually quite unique. What better way to compare the two then to walk through using them first hand. We'll start with Squarespace. Your first task when designing a new website with Squarespace centers on choosing from among the many well designed templates provided. Choosing the right template for your ultimate design goals is crucial when using Squarespace as it will govern the overall look and feel of your site. 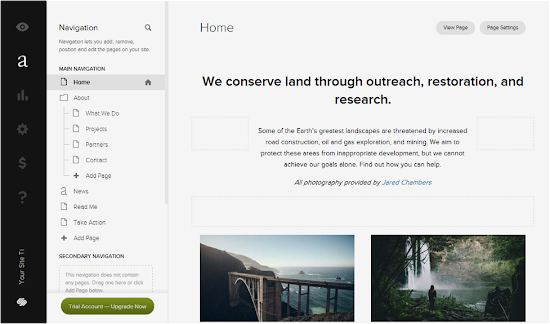 With your chosen template upon which to build your next website in place, Squarespace presents you with their web design portal. On the far left hand side of the portal resides a slender application menu. As a quick overview of this menu, the "Preview" option presents you with a live shot of what your design-in-progress looks like. The "Content Manager" is where the heavy duty design work takes place. Within this view, all manner of the site content is free to be edited. 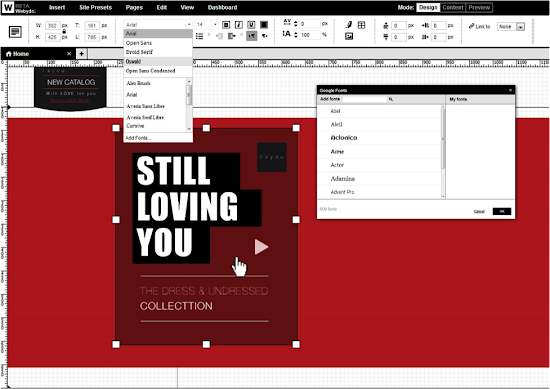 Header and footer are stripped away leaving the design area brimming with content from the body of your web pages. Pre-defined web elements such as text, video, images and forms can be jostled into place here within the confines of your chosen template. The various pages of your grand design can similarly be moved around using the navigation frame nestled next to the application menu. With content added and layouts defined, publishing your creation to the web is the next logical step. With Squarespace this task is as easy as saving the edits you've made. Once saved, all changes are made live at your desired domains. When first starting out with Webydo, a set of options is provided to get you on your way. These three options --"Design", "Layout", and "Blank"-- could even be interpreted as goals. 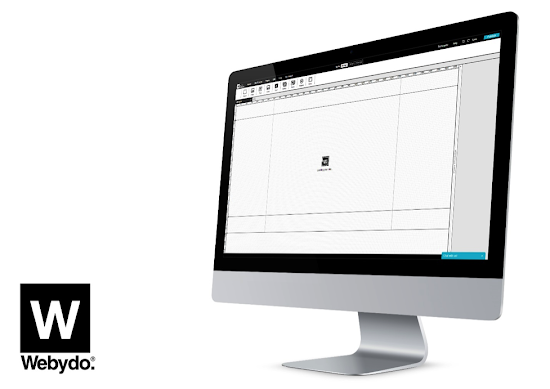 Do you want to utilize a professionally designed template to get up and running quickly? Maybe you only need to start with the basic structure of the website. Or maybe you'd like to go all in and start with nothing but a blank canvas upon which to paint your own unique design completely from scratch. The next step then is to leverage the feature rich "Design" view to kick start your project. Anyone who has experience or is familiar with using a digital canvas like Photoshop will immediately feel comfortable creating with Webydo's large canvas that comes complete with rulers and guides to help give you that pixel-perfect touch. From the dynamic menu bar at the top, you're free to drag and drop elements including (but not limited to) video, images, forms, and shapes. By simply clicking any object in your design, the menu is replaced with various applicable settings. Site presets can also be edited and new pages quickly added using the menu links at the very top of the page. At any point in the design process, you can navigate to the "Content" mode where you'll shift your focus to filling in your design with actual content. Webydo creates a nice distinction between the aesthetics and content of any given project with these two views. Finishing out the three main modes is the "Preview" option which acts just like it sounds. To publish your design, simply click the prominent "Publish" button and your site is published to a free subdomain or any domain you've registered with the service. When it comes to pricing, Squarespace starts at $8 a month for the personal package and increases from there. Webydo on the other hand offers every design feature on a Free plan and also provides a premium option that starts at $7.90 a month for unlimited page creation, increased storage and hosting on custom domains. When all is said and done, both of these compelling website design services offer excellent features in a complete package. While it would be hard to go wrong with either service, those that want more control over their designs along with a more familiar interface would likely be best served by Webydo. This article is proudly presented and sponsored by Webydo’s international community of professional designers.